When you learned how to dive your instructor told you the most important part of choosing equipment was comfort and fit. When looking for a mask you also need a great field of vision well this mask was designed to meet those and more desirable qualities. 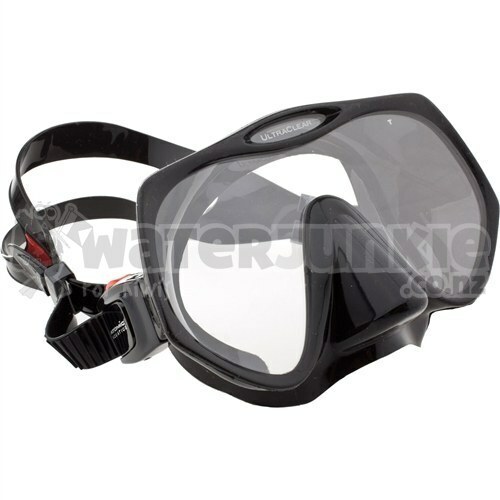 The Atomic Frameless Masks give the diver the Widest Field of View in a Single Lens Mask Design. The Mask Skirt is made from High Quality Silicone Rubber and has a Low Volume Profile to add to the Increased Field of Vision. Low Volume also makes Mask Clearing Easier due to Less Water needing to be displaced. 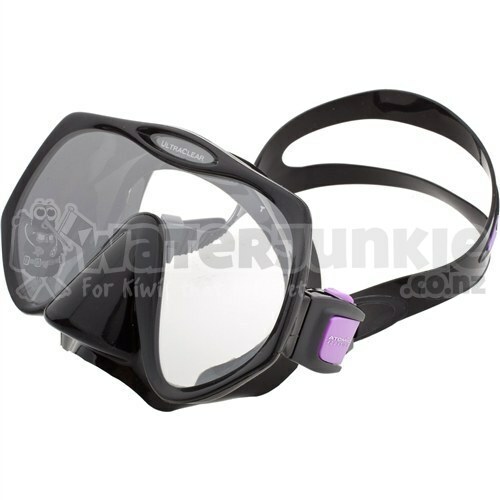 Mask is equipped with Easy Squeeze-to-Adjust Buckles that are mounted behind the lens for a more Hydrodynamic Design. The Atomic Aquatics Frameless Mask is focused on Fit, Comfort and a Wide Vision Field. The Atomic Aquatics Frameless Mask with its Large Tempered Glass Lens and Close Fitting Skirt Work-in-Harmony to create perhaps the Widest Viewing Angle of any Frameless Mask Design. The Lens Shape was Computer Designed to Maximize Upward, Downward and Side-to-Side Vision. Because an External Frame is not needed, the Viewable Area of the Lens is optimized. The Atomic Frameless Mask offers a new standard feature never seen or Seen Through" before in a Diving Mask. Atomic calls them Ultra-Clear Lenses. What makes Ultra-Clear special? Did you ever notice that Normal Dive Mask Lenses have a Green Tint to the Glass? To see this Tint, put your existing mask up to a piece of white paper and see for yourself. The Green Tint you see is the result of Iron Impurities left over in Lower Quality Float" or Window type Glass. That Green Tint Distorts True Colors and Blocks-Out some of the Light that Reaches the Eye. Ultra-Clear is a new and exciting Optical Quality Tempered Glass with Exceptional Clarity and High Light Transmission, with No Color Distortion. The Exceptionally High Light Transmittance and Lack of Distortion in the Ultra-Clear Lens Maximizes the Light available for Improved Visual Acuity, especially Underwater in Low Light Conditions, Better Vision, Truer Colors is what you get with Atomic Aquatics Ultra-Clear Lens. The Atomic Aquatics Frameless Mask has a Double Feathered Edge Skirt that provides an Excellent Seal on the Divers Face with an Easy-to-Reach One-Handed Nose Well for Ear Equalization. The Wide Split Style Mask Strap Increases the Masks ability to conform to your Face adding to its great Sealing Ability. The Mask is available in 2 sizes of Regular and Medium (for narrow faces) to fit most divers' faces. The Atomic Aquatics Frameless Mask comes 3 color choices in Medium of Red, Pink or Purple and Red only in Regular. Both sizes come with a Black Silicone Rubber Mask Skirt and Strap. The Atomic Frameless Mask is so durable it carries a Limited Lifetime Warranty! Mask also comes with a Mask Box.